It’s impossible to fit all the necessary items in a purse but we have picked 5 things that’ll help you look better, feel confident & stay hygienic. It gets even more awesome because everything in this list is under INR 100. Let’s get started? Any sort of change in the weather and your lips are the first one to bear the consequences. It goes without saying that a lip balm is a must and the best part? It’ll cost you less than INR 100. You can opt for a Nivea original care lip balm or if you love some tint then go for the Maybelline New York Baby lip. It’s natural properties will help you get rid of dry, chapped lips and keep them soft. 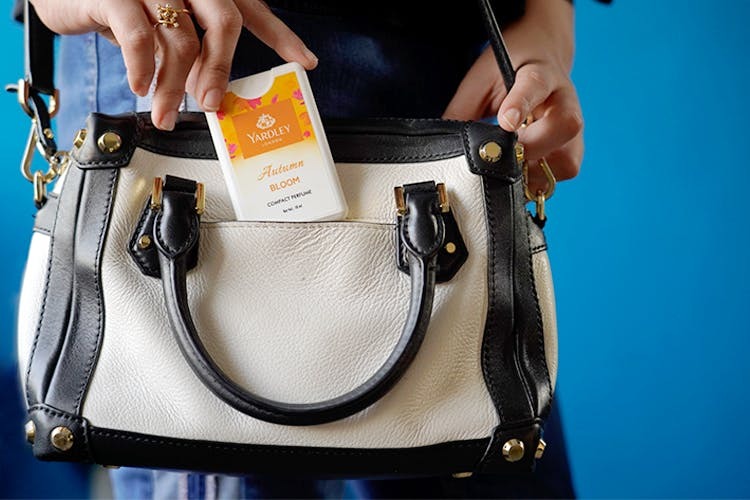 It’s important to smell great, say an urgent client meeting pops up or your BFFS plan a brunch out of nowhere, we found you a solution which is both affordable & easy to carry. Yardley London’s Compact Perfume range! From floral to musky notes Yardley London has got a fragrance for everyone. An Eau De Toilette (EDT) priced for less than INR 100 makes it a must have. We are crushing over the Morning Dew fragrance. Visit Yardley’s website to browse through their entire collection! It is both professional and wise to carry a note pad, whether you are a college student or a working individual. This is more than just an essential but a habit that’ll make a difference in your day to day life. Especially if you are a forgetful person, jotting down your tasks & to-do’s is a life saver. You can score a Navneet or a Classmate notepad for less than INR 50. Finding a source of water to wash and clean your hands might not be possible every time and this is exactly why sanitizers deserve all your attention. It is compact, helps you stay hygienic and comes under INR 100. There are multiple brands in the market but we personally think Dettol & Lifebuoy are the go-to options. With Winters right around the corner, this is a must have! Keep your dry skin at bay and that cute little tin tube/bottle of moisturizer always handy. Best part? There are a bunch of really good options that'll cost you less than INR 100 such as Nivea, Lakme, Garnier, Himalayan and Ponds! You can find them easily at any cosmetic/medical store near you or at ample of online platforms like Amazon and Nykaa. It may be a regular day at work or a short trip you plan to indulge in, we vouch by these handy essentials because of their effectiveness and pocket friendly costs.